I’m a bit of a fan of the work of Plan, ever since I used a Plan funded toilet when I was in Ethiopia. Plan UK work with children in the world’s poorest countries to help them build a better future. The majority of Plan’s voluntary income is from child sponsorship, I was amazed to discover that donors can go and visit the children and communities that they help and are encouraged to share their stories. From the Bramelds in Ghana to Cathy’s trip to Zimbabwe Plan are doing a great job of connecting people just like you and me to the cause by demonstrating the difference that sponsoring a child can make, not just to that individual child but to the whole community. With so much reliance on income from one fundraising stream, it seems that Plan are looking to diversify. Their newest campaign is called “Plan your story”. It is an online video application that takes your key information from Facebook to create a personal story of your life and how it may have been impacted if you did not have a birth certificate. It aims to put you in the shoes of the millions of girls around the world whose births are not registered, for example you are asked to consider being married at the age of 14; as an inability to prove your age could result in being married off whilst a child. It is part of Plan UK’s Because I am a Girl campaign and aims to test Facebook as a platform for raising money, gain insights on what works and what doesn’t –from an online fundraising perspective and gain a greater understanding of Plans’ online audience. So I gave it a go. I was uncomfortable with giving an application access to my information on Facebook, especially with all the media coverage about privacy. I still am anxious about it, but decided to do it anyway as I was curious to see my story. 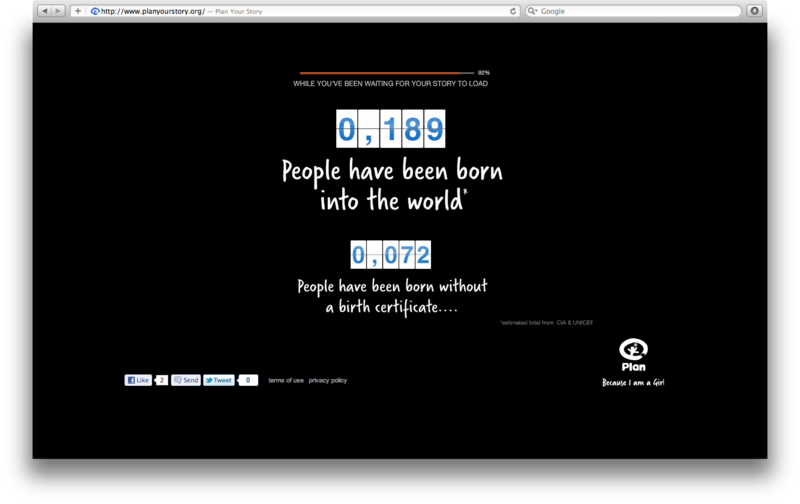 While I waited for my story to load, there is a counter on the screen that showed me the number of people born without birth certificates while I was waiting. Nice touch. Then accompanied by emotional music, I saw my story unfold. Using my images and information on Facebook, I was asked to remember what it was like being at school, studying for exams; exams that many girls are excluded from taking, the exams that change a path in your life. I was reminded of the friends I made and not forgetting the time I got a detention for chewing gum. I loved the page in the book that showed an album of my friends profile pictures. However when asked to picture what life would have been like without certain people, selected at random from my friends list, it didn’t work for me as they were people I do not know very well, so their non-existence would not have made an impact at all. If there is a way of selecting more active friends, that would have worked, or perhaps it’s a lesson for me to take my own advice and reconsider the friends I have on Facebook. It talks about your first crush; how did they know about my crush on George Michael in 1987? and asks you to imagine, at that point in your life what it would have been like to have had no choice but to marry a stranger more than twice your age or older, like thousands of 14 year olds without a birth certificate are forced to do. I really like Plan your story and whilst there is room for improvement, its leading the way in showing how Facebook can be used to help donors feel a personal and emotional connection to the cause, which is what fundraising is all about. I felt quite moved by this application (prawn aside), it did make me consider the life choices that I have been lucky to have. It made an emotional connection as well as providing solid facts and figures and there is a clear ask for a donation. Did I make one? Of course. I want to know how you are going to steward me…. The app is streamed in real-time so I can’t link you to mine, but you can try for yourself here or check out this sample. I would love to know what do you think? This entry was posted in childhood, ethiopia, Facebook, fundraising, Innovation, insight, Inspiration, Life and Death, Plan and tagged child sponsorship, community, connecting, facebook, Ghana, Plan UK, Plan your story, Zimbabwe. Bookmark the permalink. There was a Twitter discussion about this earlier this week and we did praise Plan UK for this although we came down to the conclusion that it would be even better if it was applicable for men too. Can men not take part? I wouldn’t say that it was aimed at women is the major downfall. It is fascinating what Facebook has allowed third-party websites to do, and Plan UK has fleshed this out with creative, but will this result in more donations than if they had used another platform? I don’t know. I didn’t donate £2, I don’t know how many people will. Plan UK have presented the issue well but they haven’t given a reason for your donation being “£2”. But the campaign is about being born a girl? isn’t it?